Editor's Note: Have Your Heard from Johannesburg, which earned a 2010 IDA Award for best limited series, airs January 12, 19 and 26 on PBS' Independent Lens. What follows is an article published in conjunction with the series' theatrical premiere at the Film Forum in New York City in April 2010. Connie Field was racing against time in 1996 when she first began working on her remarkable documentary series Have You Heard From Johannesburg. Many of her interview subjects were quite old, and she knew filming needed to start as soon as possible. 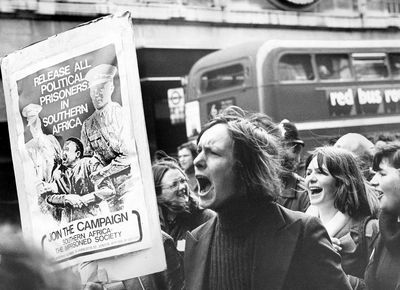 These people had played crucial roles in the epic story she wanted to tell: the history of the global anti-apartheid movement. Fortunately, Field was able to capture the insight and observations of an incredible array of people before they passed away-- Govan Mbeki and Walter Sisulu, members of the African National Congress (ANC) who were imprisoned along with Nelson Mandela; Baroness Barbara Castle, a member of the British Parliament who was deeply involved in the anti-apartheid movement in England; and Ger Wagner, the CEO of Royal Dutch Shell Group, to name a few. More than 20 of Field's interviewees are no longer alive. story of Oliver Tambo, the unsung hero of the ANC who lived in exile for more than 30 years, endlessly organizing and mobilizing support to end apartheid in his homeland; and The New Generation, which chronicles the struggles of young people in South Africa and the worldwide response to the apartheid regime's ruthless response to the Soweto uprising in 1976.
engagement," and the incredible impact of African-Americans on US foreign policy; The Bottom Line, about the successful worldwide grassroots campaigns to force corporations to stop doing business in South Africa and put intense economic pressure on the government to end apartheid; and finally, Free at Last, the culmination of decades of global grassroots movements, the South African government's increasingly oppressive response to protests, and the campaign to free Nelson Mandela. and she had directed (with Marilyn Mulford) Freedom on My Mind (1994), an Academy Award-nominated documentary about the struggle to register black voters in Mississippi in the 1960s. In 2007 she completed ¡Salud!, a documentary about Cuba's role in working toward healthcare equity worldwide. or sports during the apartheid era. She does an admirable job pulling the stories together, sometimes with uneven results, but the entire series is well worth seeing. It is also is a cogent and timely reminder that people can indeed build a global movement and force an unjust government to change. DC and South Africa. Steps International is managing the international television distribution. Documentary caught up with Field by telephone as she was putting together the final edits to Free at Last and getting ready for her sound mix. 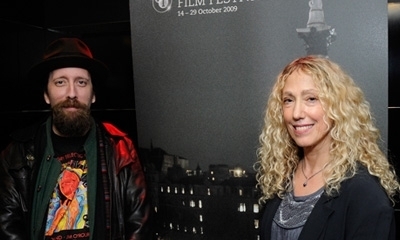 Connie Field with Have You Heard From Johannesburg series editor Gregory Scharpen. Documentary: Have Your Heard From Johannesburg takes a sweeping look at the worldwide struggle against apartheid in South Africa. How did you decide to make this subject the focus of your film? it's really not about apartheid. It's not about how things changed in detail inside South Africa. It's basically taking a subject that most everyone in the world could be appalled by. Then the question was, What then did the world do? Who did what? What were the obstacles? And it starts basically with the United Nations' creation of the declaration of human rights [in 1948]. 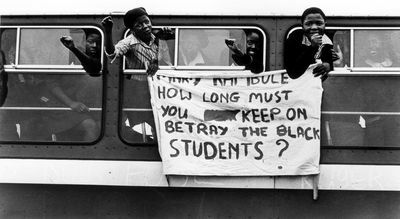 That was the same year that apartheid was instituted, when the Nationalist government came to power in South Africa. So it's really about that and it's about the working together of both the internal movement and external movement because it's an incredible example of how that can work. And it's also an extraordinary story about how a liberation movement for the people living under apartheid goes about galvanizing the entire world to work with them. The ANC was probably the most successful movement ever to do that. D: Is one of your goals to try to inspire people and remind them that mass movements can work? CF: Well, yes. As Howard Zinn used to always remind us, often it's people's history that doesn't get told. And this story, to my chagrin, has never gotten told. There have been various books over the past ten years, but nothing that focuses on it from a global perspective. D: Was that one of the challenges of making this film? CF: Yes, it was a big challenge, but I don't think that I thought about that. I was interested in this incredible story, and it would also be the kind of story that I could get some funding for because I have a background in this kind of thing. There was no way to get a sense of the scope of it because it's not like I could read a book, like the history of the Civil Rights Movement and choose my focus, which is a lot easier. I started filming early because I was very afraid that the elders in this group of interviewees would die before I had a chance to figure out the story. So I started shooting in 1997. I knew that I would be going to the National Endowment for the Humanities, which had funded my past work, so I knew I had to write very detailed scripts. In essence I thought if I could write the real scripts based on real material, as opposed to when you write a script before you've ever done anything, it would help the filmmaking process; unfortunately it didn't. So I ended up shooting first and gathering material. D: Did you conceive of this as a series from the beginning? CF: Yes, but a shorter one. I conceived of it as a four-part, one-hour [per episode] series. That was my first conception, then it grew to a three-part, two-hour [per episode] series and then it morphed into a 12-part one-hour [per episode] series, and now it is what it is. Every time you're discovering a story, like the story we did on the United States, From Selma to Soweto [originally released in 2007 as Apartheid and the Club of the West]. We were just editing, and we said, Oh my goodness, this is a whole story here. I was trying to narrow down what I was going to focus on. I decided I was only going to deal with what got done outside of South Africa that really had an effect on South Africa. So that was the guiding force. I also focused on the campaigns in South Africa that had biggest impact outside of South Africa. The US story fit that concept because once the United States sanctioned South Africa, it was a big political blow to the regime that had always depended politically on the United States at the United Nations and various places. As you see in the story, this was done over Ronald Reagan's veto. It's a very significant story in the United States because it's the first time African-Americans had really shaped US foreign policy to this degree. That's also why I put the divestment movement inside that episode. 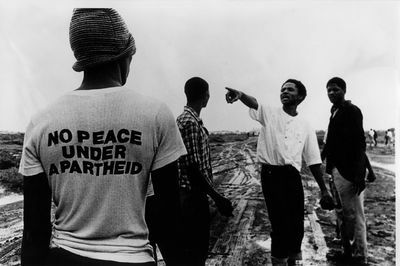 The divestment movement was part of the strategy to economically strangle the apartheid regime. Divestment was the movement in the United States--it was stronger here than anywhere else because our economic system is privatized. Here, the pensions are in private funds and invested in the stock market. In Europe, where you have social welfare states, people's pensions are with the government. So you had all kinds of opportunities to have an effect that way that wasn't true in other parts of the world. It was the base movement inside the United States that also built the movement that then affected Congress. D: How did each episode develop? CF: We just laid everything out chronologically--and that structure never worked because we would have something happening over here that didn't culminate until two episodes later. It was just not the way to organize this. In essence I've done it as a hybrid, between chronological and thematic. D: Were you thinking of doing something similar to Eyes on the Prize? CF: Yes, I had that in mind. When Eyes on the Prize was done, people understood how important the Civil Rights Movement was. I don't think people have any notion of this [anti-apartheid movement] particularly. It's not in the global lexicon, though it should be. It was one of the most important human rights struggles of the last century. D: How did Eyes on the Prize influence this project? CF: It didn't, really. This [project] was a process of discovering the stories, which was not true for a lot of Eyes on the Prize; there had been numerous things written about the Civil Rights Movement. So I was constantly discovering, Oh, this happened...Oh, this is what went on here. It was not a tamable beast. It was a different process. D: Rather than interview academics or historians, you made the conscious decision to interview people who were involved in either fighting or upholding apartheid. CF: I always do that. I learned to do that with Rosie, and it's a style I haven't quit since then. I base the films on the participants, on the people who lived that history, not the people who are commenting on it. D: Music is a critical part of the film. The title of your film comes from Gil Scott-Heron's seminal song "Johannesburg" How did you decide on that title and theme music for the series? CF: I like music titles. I like that song. That song was an early song from the '70s. I liked what it meant: Have you heard from them. The story is about them organizing the world and the world joining with them. It's not about the world coming in to save the South Africans. So that song expresses that. I always collect music as a part of the story, music from the period and of the places as being a critical part of the story. D: Did you do most of the interviews? that had no roads, and live in houses that had no electricity and no running water. But that was a vacation compared to this. D: Was there a reason that you didn't interview Nelson Mandela? CF: Well, two reasons: One, it wasn't super easy to interview him and the second thing, he's actually a very small part of this story because he's in prison the whole time the story takes place. So I just figured it wasn't really necessary to bother him. I didn't really need it for the story, and he has so many things pressing on him that I just didn't feel I had to be one of them, so I didn't pursue it. I hope he sees it. D: What were some of the obstacles to making the film? CF: We were very under-funded. This is a huge project and it's international, so we really did it on a shoestring. It meant that I made it the way I make other things: I keep the very top level very lean and save my money for spending it on cinematographers and editors. It's also why I did this all myself; I was the producer and the director. I didn't have enough money to do it otherwise, to hire other producers. Also, I’d been very lucky to work with a couple of extremely loyal young people. Without them, it would have been really depressing. Twelve years ago, I first hired Greg Scharpen to do the archiving, and he then became an Avid assistant and eventually the series editor. Sage Brucia, a terrific graphic designer, has been with me for six years. They stuck around for a really long time and for not a lot of money. D: So how were you able to support yourself? CF: Well, I did another film that I got well paid for [¡Salud!]. It paid our rent. My staff is very generous with me. We used to have a great situation in our building before Saul Zaentz sold it in 2004. He never raised the rent for almost 20 years. I was able to get a ton of space for very little, so I didn't have much overhead. All of those factors allowed me to continue on what we had and make it stretch. D: Will you be screening at Encounters, the doc fest in South Africa? CF: I don't know. I'm really looking for places that will show the whole thing. I'm hoping to get set up in South Africa and hopefully the Ford Foundation will help out with that. I want to present it in Johannesburg, Durban and Cape Town in three different venues. It'll probably be a free showing. I'm hoping that will happen in July and August. I'm also hoping to go to Zanzibar in July with the whole thing. Tambo story [Part Two: Hell of a Job], all those become more meaningful. The first three parts give you a lot of context to have a lot more meaning than just seeing the features by themselves. story will start to be out there in the universe. Nobody has given this stamp out there in the world that says this is an important thing that happened and people should know about it. Chuleenan Svetvilas is a writer and editor based in Oakland, California.